One of the more interesting charges that developed in Spanish heraldry is the caldera gringolada (cauldron gringolé), a cauldron with the heads of serpents (or snakes or eels, depending on which heraldic author you're reading) issuing from it. The cauldrons themselves are typically drawn with simplified silhouettes (resembling a roundel with the upper half voided), and often divided into multiple parts of two or more tinctures (striped, for example, or checked). The serpents' heads may use one or more of the tinctures of the cauldrons or not, and come in even numbers ranging from two to sixteen. They are usually divided into two groups, each centered where one end of the handle meets the top of the cauldron. The cauldron, or cooking-pot, which appears in the coats of arms of so many great Spanish families, ought perhaps rather to be counted among the military charges. The Pendon y Caldera were presented by the Sovereign to the newly created Ricos hombres, or Knights Bannerets, - the banner denoting authority to levy and lead troops, the cauldron the ability to feed them. Calderas gringoladas, according to José Juan Carrión Rangel's heraldry blog , began as an artistic variant of the basic heraldic cauldron. The upturned ends of the handle were extended, and the extensions given heads, as decoration. Over time, various armigers multiplied the heads, altered their colors, and otherwise elaborated the design, perhaps in an effort to difference one's cauldron from another's. 1) The source cited for this information is "Origin de las dignidades seglares de Castilla y Leon, lib. i., cap. ix." I think it likely that this is the book of that title written by Pedro Salazar de Mendoça in Toledo in 1618. The relevant passage from the source text is quoted in the treatise. 2) The source cited for this information is Eduardo Pardo de Guevara y Valdés' Manual de Heráldica Española. The blog includes some images excerpted from the book that illustrate the purported development of the charge. The first four calderas gringoladas pictured above come from BSB Cod.icon. 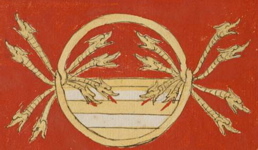 290, a 15th- to 16th-century Iberian armorial in the collection of the Bavarian State Library. The other two are from BSB Cod.icon. 267, which is 16th-century and Italian. The black cauldrons come from BSB Cod.icon. 307, 392 d, 278, 310, and 390, respectively, and the serpent-less striped one sans from BSB Cod.icon. 267.